Pogle’s Favorite Garlic Spaghetti Sauce…now with meat! One of pog’s favorite stories is about home ec and the rather strong spaghetti sauce he made. The boy simply loves garlic. I started making homemade spaghetti sauce not long after we were married and it is still his favorite thing for me to make him. As for me, as picky as he is I’ll jump at any chance to get some veggies down his gullet. Thankfully I love garlic too. I just had to show off our other finds too. 😉 Mason jar for scale (recycled from purchased sauce and used for storing homemade sauce in the refrigerator). Cook ground beef in a skillet until browned; drain off or absorb fat (I use paper towels for this). 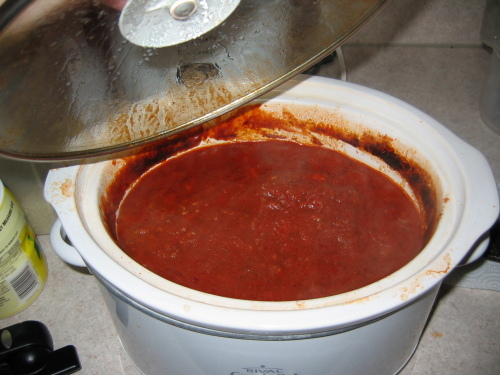 In a large crockpot, combine cooked ground beef, tomato sauce, tomato paste, garlic, and seasonings. Mix well and cook on low for about 4 hours. Be tortured by the smell until it is done. After 4 hours, turn off the crock pot. I recommend that you make some spaghetti or breadsticks to eat with the fresh sauce. Nomnomnom. Leave remaining sauce in the crockpot to cool. When the crockpot is cool enough to work with, you can either put the entire thing in the fridge (I only do this overnight or so; do place a potholder down, just in case!) or get out a couple of mason jars to fill up. 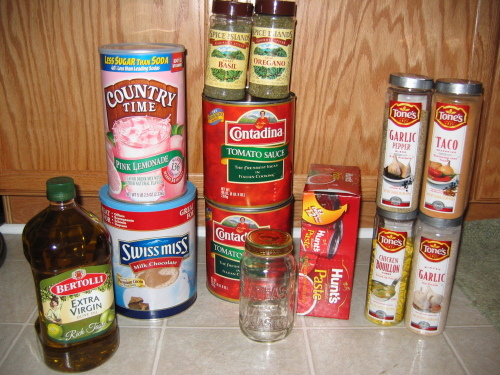 The acidity levels of tomato-based sauces will keep this sauce good for a very long time in the fridge. Be sure to use some bread to clean the inside of the crockpot. Why let it go to waste?! Nomnomnom. This recipe is guaranteed to give you garlic breath, so make sure you share with those closest to you to inoculate them to the smell. The whole process is too much art and finesse, with not enough mechanical precision for my taste, heh. Also, that seems like a lot of sauce for 1lb of meat…68 oz? Though I guess if you added more meat it would be hard to use it so versatilely (is that even a word?) as you described. Well, this is the first time we’ve gotten the meat recipe to work, to be honest. The crockpot turned out to be the secret. Typically, we’d keep some turkey or beef already cooked and sitting in a container in the fridge for pogle to sprinkle on his spaghetti. We have a tendency to halve or quarter the amount of meat called for in recipes because it is really just too much for our daily requirements. This sauce seemed to have just the right amount of sauce versus meat for us. I’m very much so a meat person, far more than Meabh. I just tend to moderate my appetite for it since it means a lot less cooking work. I could certainly stand for a lot more meat in the sauce and would love every second of it, but its a lot better for me this way and I still get some meat, so I’m content. I might try a higher meat ratio in some smaller batch in the future just as a treat, of course. As Meabh mentioned, we often just cooked the meat separately and would combine it on a per-serving basis, so I can always ‘spike’ the sauce with some extras, as well. Also, one reason we do enjoy having people visit at times, is because we almost never cook anything more complex than crockpot recipes or other relatively simple items without the excuse of cooking for someone else. We’re very lazy about food most of the time (myself more than Meabh), so without having someone to show off for, what latent talent we have mostly sits on the wayside.